Vaccine Manufacturing and Production is an invaluable reference on how to produce a vaccine - from beginning to end - addressing all classes of vaccines from a processing, production, and regulatory viewpoint. It will provide comprehensive information on the various fields involved in the production of vaccines, from fermentation, purification, formulation, to regulatory filing and facility designs. In recent years, there have been tremendous advances in all aspects of vaccine manufacturing. Improved technology and growth media have been developed for the production of cell culture with high cell density or fermentation. Vaccine Manufacturing and Production will serve as a reference on all aspects of vaccine production by providing an in-depth description of the available technologies for making different types of vaccines and the current thinking in facility designs and supply issues. 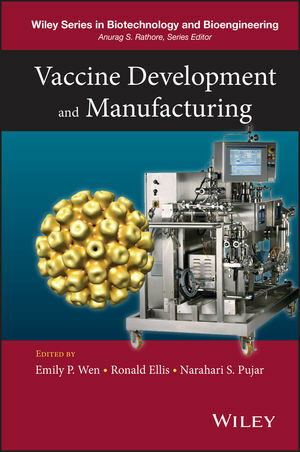 This book will provide insight to the issues scientists face when producing a vaccine, the steps that are involved, and will serve as a reference tool regarding state-of-the-art vaccine manufacturing technologies and facility set-up. Emily P. Wen, PhD, is currently a Research Fellow at the Merck Research Laboratory in the department of Vaccine Process Development. Dr. Wen has led process developments for several major vaccine products from Phase I to Phase III clinical trials, including vaccines against hepatitis B, Haemophilus influenzae type b, Pneumococcal, Meningococcal, and Group B Streptococcus. Ronald J. Ellis, PhD, is Chief Technology Officer at FutuRx Ltd in Israel. Dr. Ellis has >30 years of industry experience in line and senior management in many companies, including roles as project leader and champion of projects that resulted in 5 licensed vaccines which accrue ~$4B in annual sales. He is the founding and incumbent Editor-in-Chief of the MedLine-/PubMed-indexed journal Human Vaccines & Immunotherapeutics. Narahari S. Pujar, PhD, MBA, is currently an Executive Director and Integrated Product Leader in the Vaccine Business Line at Merck & Co., Inc. Dr. Pujar has contributed to a variety of vaccines and biologics products and product candidates. He is an active member of the American Chemical Society and was the past chair of the Division of Biochemical Technology. Anurag S. Rathore, PhD, is Professor in the Department of Chemical Engineering at IIT Delhi, India. He is an active member of the Parenteral Drug Association (PDA) and American Chemical Society (ACS) and have authored more than 200 publications and presentations in these areas.